I have always been an art lover. Not an artist, mind you, but I have always enjoyed other people's art. I've been blessed to have had many opportunities to visit some incredible art museums and galleries around the world. For some reason, art has really had an impact on me these past several months. It all started in the fall. 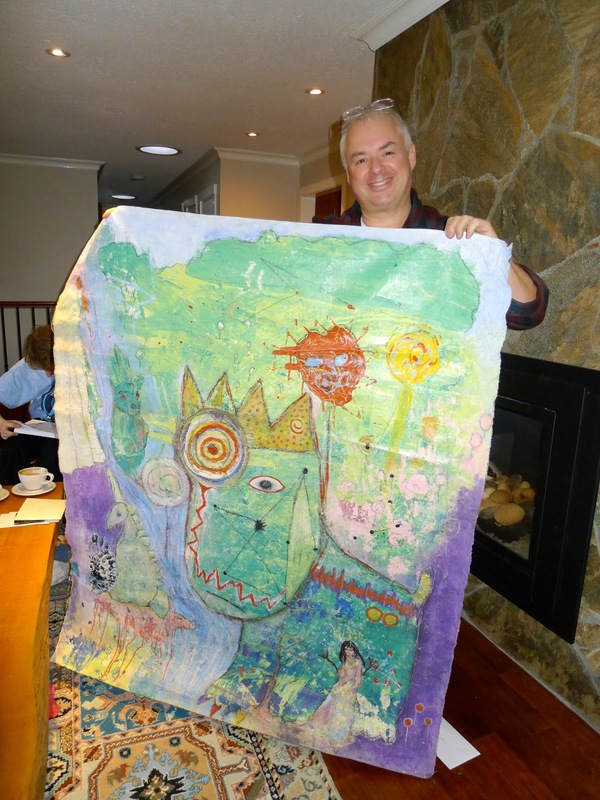 Joe and I went on the East Side Culture Crawl in Vancouver where he immediately fell in love with a painting titled 'The Lollipop King'. He talked to its creator, Luchia Feman, for a very long time. Afterwards, he could not stop thinking about her painting. "Nanc, if you were to cut off the top of my head and look inside, that painting is what you'd see," he said to me on our drive home. It wasn't until our friend Colleen suggested I buy the painting for Joe and give it to him for Christmas, that I really sat up and paid attention. E-mails flew back and forth between Luchia and myself, money exchanged hands. 'The Lollipop King' was rolled up and shipped up and surprised Joe on Christmas morning. He was thrilled. Then the ripple effect of art began in earnest. I teach at an arts infusion school. My colleagues and I infuse art into the entire curriculum: math, science, language arts, P.E., social studies. My students create colourful pinwheels when we learn about the wind and weather, they paint pictures in response to a story they've read, my students use mixed media to create characters to write about. I thought to myself, "Put your money where your mouth is, Nancy! You expect your 5 and 6 year old students to learn and create art every day. 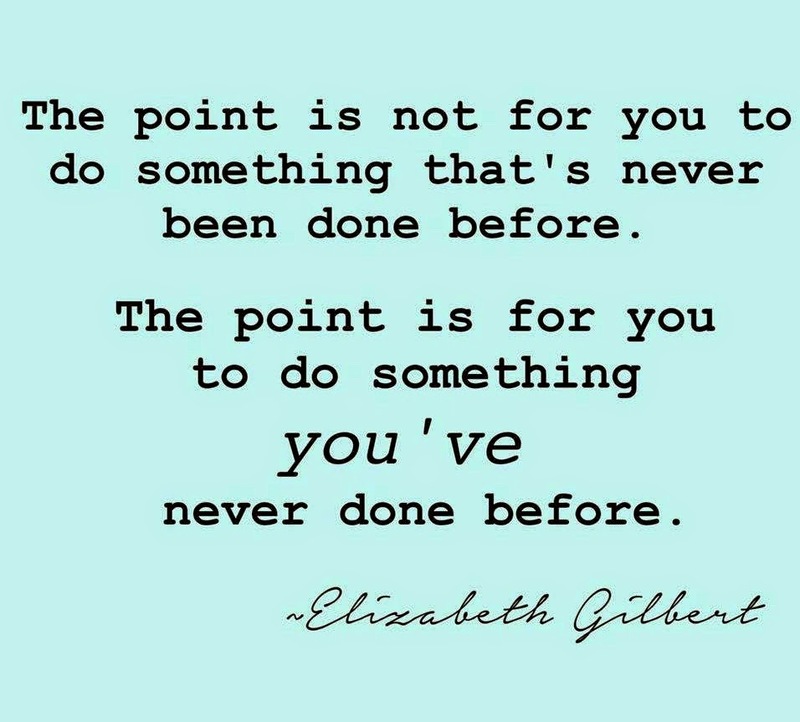 How about trying it yourself?" So I signed up for painting lessons. With the one and only Toby Jaxon. I have taken a total of 4 lessons and this is what I have learned: PAINTING IS DIFFICULT! I have vowed to never again march through an art gallery or museum only giving a cursory glance to some of the paintings hanging on the walls. I will appreciate every painting (even the ones I don't care for) because now I know how much heart and soul an artist has poured into each piece. The best thing about painting? For me? I absolutely love the feeling of spreading thick paint on the canvas. I could do that all day long. Smooshing paint around on my palette. The best feeling in the world. While I was taking painting lessons during the evenings, I was also doing a lot of art with my colleagues on Professional Development Days at school. My portrait of my friend Shuna. 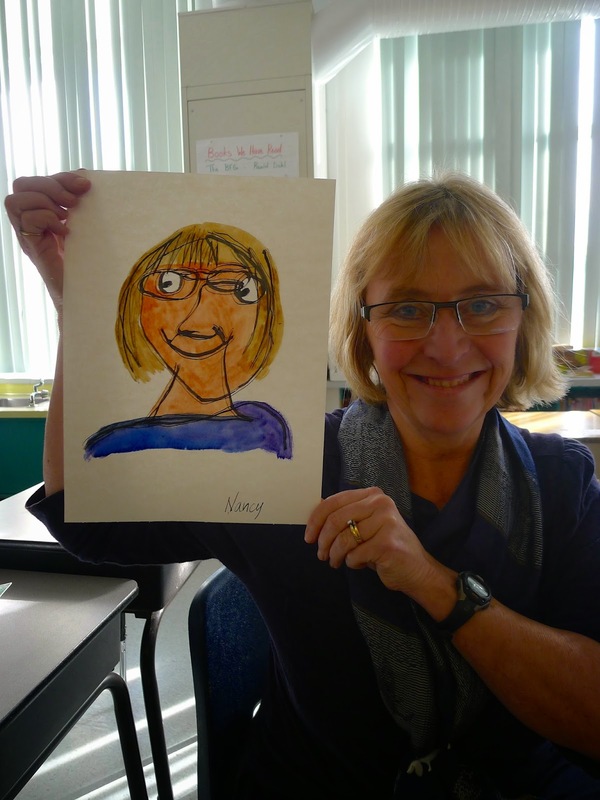 One Pro-D art lesson was to draw a portrait of a person with my eyes closed. And the kicker? My pencil could not leave the paper. For some reason, I found this kind of art project much easier than painting! When the 'Lollipop King' was finally framed and ready to be hung on our livingroom wall, a friend suggested we have an unveiling. I got the idea to piggyback onto this event and have an art show of my three paintings! I invited Colleen (who also took lessons with Toby) to join in with her paintings. And our art show was born. I asked my art teacher Toby and friend Michelle (both professional artists) if they'd like to show their works alongside mine and Colleen's. They both jumped at this once-in-a-lifetime opportunity! We invited a few art loving friends to come over to our place on Friday night to meet the Lollipop King and to bask in the joy of our paintings. Luchia Feman travelled 2 hours to Squamish for this auspicious occasion! Everyone, husbands included, were pressed into action to hang the show. Down came the paper to reveal the framed 'The Lollipop King' to the applause of the crowd! Luchia spoke about her creative process with the Lollipop King. Q and A with the artists. Not every artist can say they've had their painting hung under a hood fan. 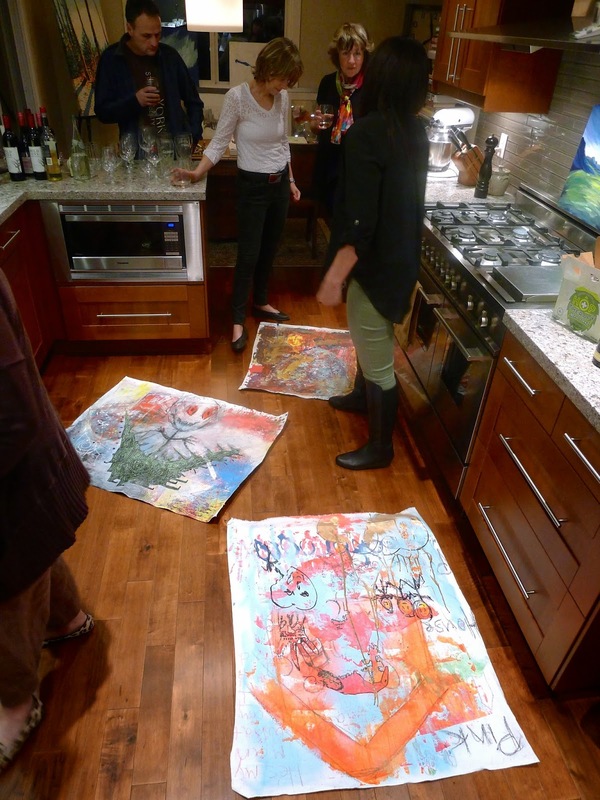 Our livingroom was chock-a-block with paintings. No room to display art on the walls? No problem! The floor will do as well. My friend Michelle and her paintings. My friend and art teacher Toby Jaxon with her latest painting. Luchia even brought an art project for everyone to participate in! We were to 'Make A Mark' on two canvases with our non-dominant hand. Me and my new friend Luchia Feman. No event at our house is complete without food. Joe's latest obsession is 'Canelés de Bordeaux'. This dessert was a big hit with the crowd! So what is next? I am taking another set of painting lessons with Toby in April and May. And Michelle is giving collage/painting lessons using ephemera next month. I am so excited to continue on with my art journey!